I always want my own information squad when I go hiking. A group of people that are experts on the flora and fauna of the area, the geography of the region, and the nuances and hidden treasures of the land I’m treading. I still experience so much wonder and awe when I’m walking through nature. Like a child discovering and trying to make sense of the world, I want answers to the countless questions I have. What plant is this? Why does it grow here? Can I eat it? Why is the soil this color. What type of bird is that? What animals live here? So many questions go unanswered because nature tends to be secretive. It was just starting to sprinkle when, despite Google Navigation’s best efforts to derail us, we arrived and met Chuck, who was helping coordinate the volunteer day we were here for. He introduced us to the other regular volunteers, and we all set out into the fen on what Chuck dubbed his “Magical Mystery Tour.” As we explored the fen, we were delighted to realize we were in the company of experts. These fab five gentlemen knew the over 700 acres that make up The Nature Conservancy’s Ives Road Fen Preserve better than most people know their own yards. They were able to answer nearly every question we had. And as we realized their level of expertise, the amount of questions we blurted out began to snowball. Who knew that this unassuming bit of land hidden below a road and behind a golf course was so important and special? Apparently nobody until a fateful day over thirty years ago when Bob, a botany professor, stumbled upon it driving home one evening. It was overrun by invasive species and trash, and hindered ecologically by drainage ditches and farming tiles. It was a shadow of its former self. It needed help, and Bob and The Nature Conservancy were just the allies it required. Bob, still playing an integral role in the fen’s recovery to this day, was one of the team of volunteers/fen experts we were lucky enough to be walking with. Three decades later, the fen is healing and healthy again, but still requires intensive maintenance and attention. That’s why we were all here on this rainy day. To help remove invasive plants like garlic-mustard, honeysuckle, and glossy buckthorn. Just as our tour was concluding and the work was about to begin, the skies opened up and a deluge of rain washed over us. 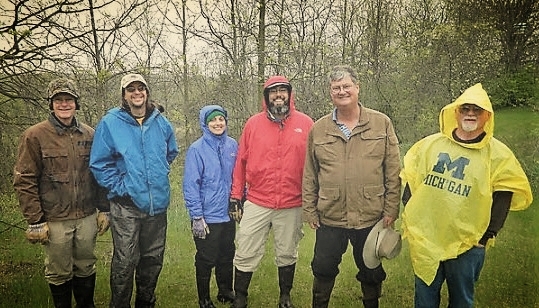 Unfazed by the precipitation, we all slogged out into the fen, prepared to power through and start the work of eliminating the non-native plants plaguing the area. The skies had different ideas. With a bright flash of lightning, and the too-close roar of thunder, we all got the message that it was time to turn around and seek cover. One by one the other volunteers, who show up nearly every Saturday morning in the spring and fall, decided to cut their losses and head home, knowing they would be out the following weekend, working tirelessly as usual. Chuck, knowing that Tara and I were eager to help but only had this one chance, was patient and magnanimous with us. He led us to the field office for the preserve, and the three of us waited out the storm while watching birds take shelter under the eaves of the building. We continued to pepper Chuck with questions. He continued to answer them with a smile that evoked a sense of his own wonder at the beauty and peacefulness of the fen. Chuck has an indefatigable love for Ives Road Fen and surrounding woods. He’s been volunteering here for nearly 20 years. He’s given close to 20,000 hours of his life to its restoration and preservation. He even moved closer to it post-retirement so he could devote more time to it. It’s like a child to him, and he’s ever so proud of how it’s matured over the years. Despite our fear that we were monopolizing his time, we soon realized that spending an hour waiting out a storm was just another way for him to commune with his beloved land. The storm finally passed, as they always eventually do, and we headed out to play a small part in working to fix the mistakes of both previous and current generations. To right some of the wrongs we’ve committed against nature, by giving her a helping hand in restoring the balance that is so integral in our shared survival. Something as small as pulling some weeds and cutting down some bushes can have a global impact. It helps heal the land, and just might heal the person in the process.